It was a privilege to return to the 2016 National Cherry Festival in Traverse City, Michigan, over the 4th of July weekend. 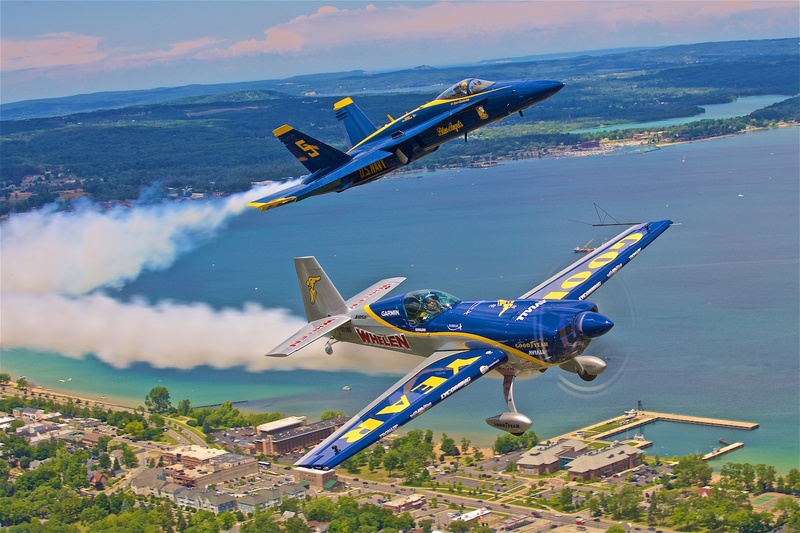 The Cherry Festival hosts a weekend air show (Friday – Monday) to kick off the week-long event. Absolutely stunning weather brought out the fans in droves to watch Michael, Kevin Copeland, Redline Airshows, the US Coast Guard, and the Navy’s Blue Angels. Michael’s first appearance in Traverse City was 20+ years ago. Over the weekend, the team was able to capture its first 360 degree video to showcase Michael’s performance over Lake Michigan. Check out the short video clip below – giving you a glimpse of his awe-inspiring maneuvers. Pan around to see different view points of the flight. To watch the video, navigate over to this YouTube link for the full experience! Michael was also humbled and honored to have a rare opportunity to fly in formation with Navy Blue Angel Lt. Ryan Chamberlain, #5 solo pilot and good friend.